Halifax coach Richard Marshall has put the emphasis on his players’ individual performances ahead of Saturday’s televised Super 8s Qualifiers trip to Warrington (3.15). Fax lost out 36-12 to Widnes last weekend and now face arguably their biggest challenge in seven Qualifiers fixtures against Marshall’s hometown team. And the Shay boss, who worked as an assistant coach to Tony Smith before leaving for the Shay three seasons ago, said his players were firmly focused on improving on their efforts against the Vikings. “We were disappointed with what we did last week,” admitted Marshall. “This week, we’ve spoken about just producing better levels as individuals, because if we can do that then we believe the collective will look after itself. “We’re under no illusions; it is going to be very, very difficult to get a result this weekend against a very talented team. “Warrington have had a difficult season, but on their day they can beat any side, not just in Super League but in the world, as they showed when they beat Brisbane at the start of the year. “They put 50 on Catalans, who are a good Super League team themselves, last weekend so that tells you everything you need to know. “We’re going to go and play with enthusiasm and challenge ourselves. “It’s exciting for us as a club; for all the players, and maybe more so for me, Simon Grix and James Saltonstall, who have all been there in recent years. “I really enjoyed my time there and I learned a lot from Tony, but in hindsight it was definitely the right time for me to move on and take on my own challenge with Halifax. Marshall’s team selection has been complicated by the absence of in-form full back Will Sharp, who was given a one game ban after tripping an opponent against Widnes, and an injury suffered by Australian forward Mitch Cahalane, who is definitely absent. 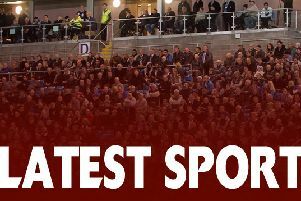 There are also doubts over a clutch of others - Rob Worrincy, Shane Grady, Brandon Douglas, Ben Heaton and Scott Murrell all sat out training on Tuesday night - meaning definite recalls for Saltonstall and another back, James Woodburn-Hall. “We’ve got a few injuries and it’s not a game where I want to risk players, however much they want to play,” said Marshall. “Saltonstall will come back and either him or James will replace Will.